The world is about the get a lot……..taller. Building tall, that is what an increasing number of cities are now gearing up for. The goal of transforming cities into more dense, compact and sustainable places is making them consider growing upwards rather than outwards. What constitutes a tall building is very place-specific. A ten-story building can be considered as “tall” if located in an area dominated with two-story townhouses or not at all if surrounded by forty-story skyscrapers. Here, I consider a building tall when it is significantly taller than what surrounds it. Tall buildings are far from being a new thing. Skyscrapers and high-rise residential towers have been common features of urban landscapes since the mid- 20th century. Cities like Toronto, New York City, Hong Kong and Singapore have even already massively embraced tall buildings for the production of their built environment. However, in most other cities, the construction of tall buildings has remained strictly controlled by local planning authorities through rigid zoning bylaws. From Montreal and London to Paris, tall buildings could only be built in specific areas (sometimes only on specific sites) and with non-negotiable height limits. Concerns about the protection of the city’s character, view corridors, heritage buildings and liveability have led cities to limit building’s heights to only a handful of stories. Furthermore, residents have remained relatively reluctant to the construction of tall buildings in their neighbourhood. But with many cities now running out of land for development, seeking to intensify their urban fabric and/or looking at new revenue sources, tall buildings are becoming an increasingly attractive built form. The willingness to regenerate the inner city through higher density and mixes of activity is also an argument in favour of tall buildings. What’s more, the current property market is clearly benefiting taller buildings. Skyrocketing urban property prices and demographic shifts (ageing population and smaller households) mean that many more urbanites are now willing (if not forced) to live in smaller dwellings and therefore closer to one another. Consequently, a large number of cities around the globe are now seriously considering increasing height limits for new buildings. In Montreal, the downtown borough of Ville-Marie has just proposed a revision to the official plan to allow for more and higher buildings throughout the city core as part of the city center intensification strategy. In Vancouver, the city council has adopted a policy to unlock the height limit for new buildings on specific sites in the downtown core. In London, the City of London’s planning authority has adopted a policy to significantly increase the number of skyscrapers and high-rise residential towers in the British capital’s financial district. This decision came in response to a shortage of office space and serious land scarcity in the “Square Mile”. The so-called “clusters of towers” are intended to consolidate the City’s position as London’s primary business and financial area. They are also expected to significantly transform London’s skyline in years to come. Despite increasingly good market conditions for taller buildings, there is still much reluctance in embracing them. In many cities, high-rise residential towers still have a bad reputation because they are associated with housing tower blocks built in the 50s and 60s where poverty, exclusion and crime are king. There is concern that after a certain number of years, newly built high-rise towers may fall in the same pattern as those built sixty years ago: degradation and decay. Also, residents voice concerns about issues associated with historic preservation, local character and environmental protection. 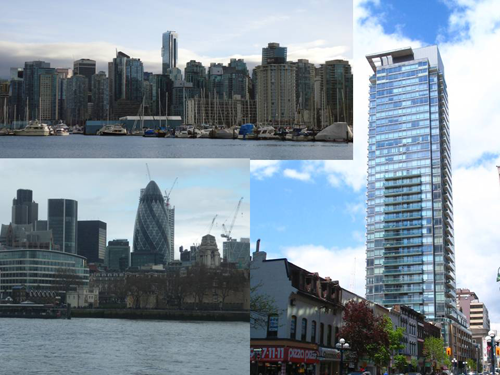 In post-industrial neighbourhoods of Montreal and London for instance, tall buildings face little social acceptability as residents highly value the fine grain and organic nature of their urban fabric. Furthermore, many projects are being criticized and even stopped because they fail to address the issues of heritage, environmental and view corridors preservation, not to mention the significant impacts of increasing density on local infrastructures and land values. So if there is so much resistance to tall buildings, why should we still want to build them in our cities? Because building taller should also mean building smarter, by using a more sophisticated approach to tall buildings. In effect, contemporary tall buildings have the potential to making great communities through good urban design and planning principles. The Vancouver model is particularly interesting in this respect. Tall buildings in the city center of Canada’s third largest city are built in a way to integrate very nicely into the city’s urban fabric, in addition to contributing positively to liveability and streetscape definition. 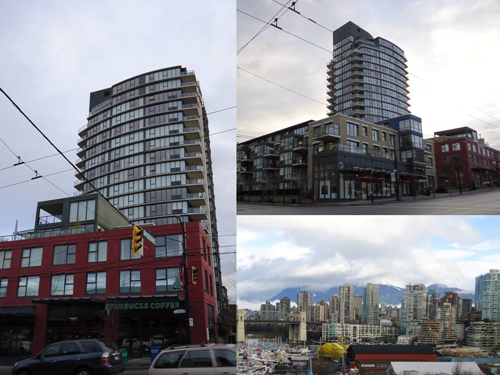 The so-called “Vancouverism” approach consists of 20-30-storey mixed-use buildings where a setback tower sits behind a 3-4 story podium which faces the street. Furthermore, Vancouver-style towers are carefully designed through a public consultation and negotiation process with the community. Also, Vancouver has limited the height of buildings to about 40 stories to protect its exceptional mountain view. As a result, Vancouver has inherited of one of the most spectacular skylines and urban environments in the world. In conclusion, the stakes are high for cities with plans to go taller. They face being transformed forever, for better or for worse, depending on the direction they choose to go in. The transformation has the potential to be very positive, but only if tall buildings are planned carefully and based on the very features of their local context. As we have seen for Vancouver, tall buildings not only will make cities taller, they also offer an opportunity to make them better places to live in.